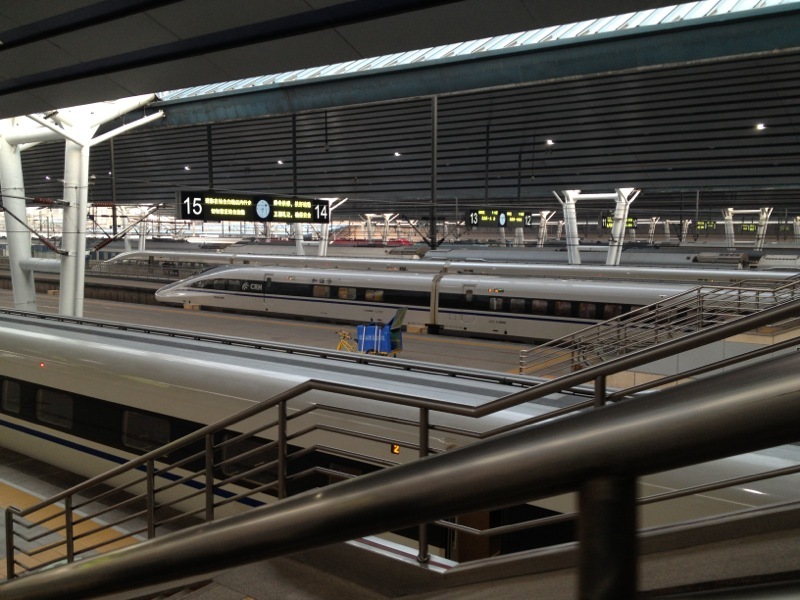 All 2,298 kilometres of the Beijing-Guangzhou High Speed Railway has opened up on 26 December 2012. This means it is now possible to travel by HSR on the world’s longest HSR line — from Beijing West to Shenzhen North. The Zhengzhou-Wuhan part already opened in late September 2012, with the part from Wuhan-Guangzhou opened already in late 2009 (extended to Guangzhou South in January 2010, and to Shenzhen North in 2011). Trains will usually continue beyond Zhengzhou East, either to the south, or to the north, although some may also run in other directions. For example, there are a few through trains that run via Zhengzhou East further westwards, towards Xi’an North. Some new stations in this part of the line have station names which already substitute English cardinal directions with that in Pinyin, which can be very confusing for the passenger from overseas. The station names used here are in normal English. Departing from Beijing West, most trains that run on this line are CRH380AL trains, in contrast to those on the Beijing-Shanghai HSR, which are mostly CRH380BL trains. Shijiazhuang Railway Station is the most significant new station. The new station simply does not compare to the old station, which was cramped and had only three full platforms. The new station has platforms up to number 24, has a huge waiting hall, and allows people waiting for trains to enjoy scenes of the station. It is also much easier to get to the new station, as cars can drive right up to the station entrances. Zhengding Airport Railway Station has connections to the nearby Shijiazhuang Zhengding International Airport. This is the fourth station in mainland China to connect to an airport. In future, trains will leave Beijing from the Fengtai Railway Station, which is supposed to be upgraded and fully rebuilt. At the moment, trains leave Beijing from the city’s West Railway Station.